You can see the knot in the oak plywood in this photo. I tried to find wood with interesting qualities for this box, such as knots, grain lines or different colorations. The pine molding around the edge is beveled on the corners, and is 3/4″ thick. The center is made of 3/8″ oak plywood and the entire box is stained a natural color and then varnished with two coats of clear semigloss. Even though the top was a single piece of laminated, edge glued pine, it still warped before I could install it on the toybox. I straightened it by screwing these two cleats to the bottom of the lid. The platform the lid rests on forms the top of the box, with the corners beveled at a 45 degree angle. In one corner you can see one of the 2″x2″ vertical supports. Good to see it’s being used! The top is made of a factory-glued single piece of laminated pine. The horizontal and vertical strips are 3/4″ pine and the center is made from a piece of 3/8″ oak plywood. 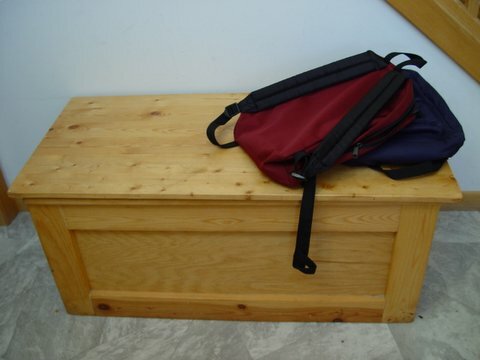 I made this toybox several years ago for a friend of mine who was pregnant and lived up in Illinois. It was based on the same pattern that I made my first toybox from (sorry, I have no photos of that one), but to make it easier to ship I had to change some of the design. For starters, I eliminated the legs so the base sat directly on the floor. Also, I changed the overall length so it would fit in my car for the trip to the shipper! 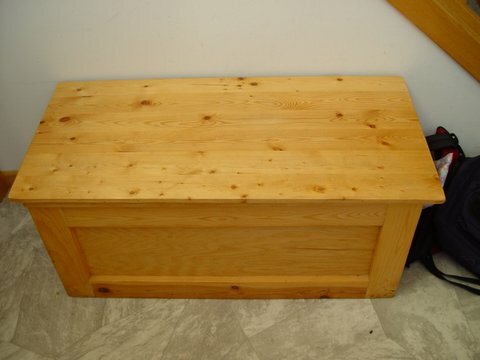 The design is from a plan for a Shaker style bedroom quilt chest, and is made out of 3/4″ pine boards with cabinet quality plywood in the center panels. Overall dimensions are 42″ wide, 20″ deep and about 20″ high. The top is a laminated series of pine planks. You can’t see them, but inside the box is a framework of 2″x2″s for strengthening. 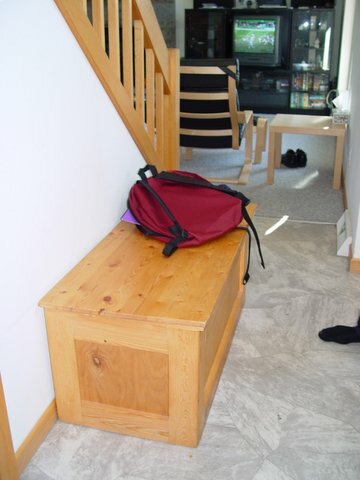 They were fastened together with steel angles and wood screws. The floor is a piece of 1/2″ plywood cut to fit the opening. All the wood came from your basic lumber section of Lowe’s, but I tried to select pieces that had some interesting qualities to them. 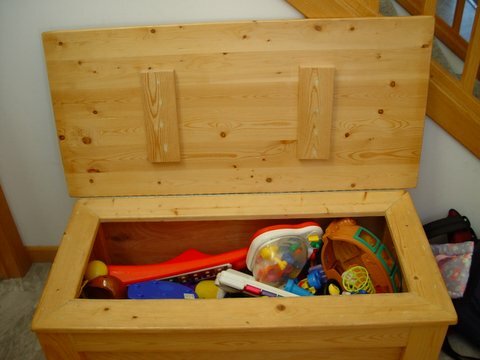 One of them can be seen in a side view of the toybox, where there’s a dark line of wood running through the center of the upper plank. The lower plank has a dark center that stands out as well. As I was assembling the top, I discovered that it had somehow warped and was curved upward despite my efforts to keep it flat. I attached two short sections of 3/4″ pine to the underside of the top to straighten it, fastening it to the top with wood screws from the underside. The panel the top rests on were beveled on a 45 degree angle and overhang the sides to provide additional support for the top. They also help conceal the 2″x2″ supports within the box. You can just barely see one of the vertical 2″x2″s in the upper right corner of the box. Thanks for keeping the toys in there! They help hide a lot of my mistakes I made! Once I had it assembled, I sanded the surfaces smooth by hand, then stained the entire structure with a natural color stain that didn’t change the overall color but did darken it slightly. Once the stain was dry I then put two coats of clear coat varnish on it, sanding in between the coats. Getting it up to Illinois was a challenge. I used UPS to make the arrangements, and alerted my friend that she should be on the lookout for a package from me to be arriving soon. She had no idea that I was sending her a 42″ long toybox, however! UPS did an outstanding job of getting it safely to Illinois, and she was completely surprised and thrilled to get it. Fortunately for me the finish on the box completely matches the wood finishing in her house!